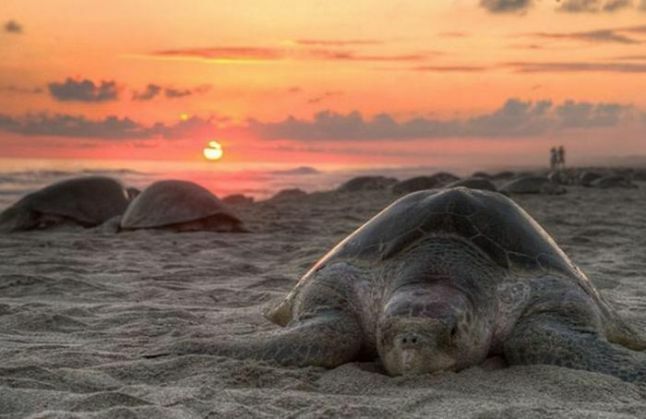 In order to protect the endangered Olive Ridley sea turtles that arrive during winters for nesting, the Odisha forest department has imposed a seven-month ban on fishing along the coast, an official said. The ban will be in force from November 1 to May 31, 2016. The endangered Olive Ridley turtles arrive every year during winters for mass nesting in Rushikulya river mouth and Gahirmatha marine sanctuary, said a forest official. The restriction has been imposed as per Odisha Marine Fishing Act (OMFA). "Trawlers and fishermen have been directed not to fish within 20 km off the coastline in the turtle nesting sites. Use of motor boats and mechanised trawlers for fishing within 5 km from the coast between Astarang and Baliharchandi in Puri district has been prohibited," said Puri divisional forest officer (DFO) Chittaranjan Mishra. He said patrolling would be carried out along the coastline while action would be taken against the violators under the Odisha Marine Fishing Act (OMFA). Over half a million Olive Ridley turtles arrive and congregate in the shallow coastal water of the Bay of Bengal in November and climb ashore for nesting between December and March. Most hatchlings emerge by May. The state has three nesting sites -- Gahirmatha beach in Kendrapada district, Devi river mouth in Puri district, and Rushikulya river mouth in Ganjam district. The Gahirmatha turtle sanctuary is one of the world's largest turtle nesting sites. To protect the endangered species, on-shore camps have been set up at 13 places including Devi mouth, Devinasi, Daluakani, Chandrabhaga and Ramachandi, said sources. Besides, four temporary incubation centres have also been set up to keep the eggs safe.